From the 1950s and onward, the art of bonsai spread rapidly outside Japan to become a worldwide phenomenon. The 1950s was a decade of great changes, both in Japan and abroad, and it became much easier than before to get hold of bonsai books in other languages than Japanese, and books that weren’t merely translated but written from scratch with a non-Japanese audience in mind. In 1957, Japanese bonsai master Yuji Yoshimura’s book “The Art of Bonsai” was published, written in English by his student Giovanna M. Halford from England. This book became very important for non-Japanese bonsai enthusiasts worldwide and it has been reprinted over 30 times since its initial edition. In the book, Yuji Yoshimura addresses various aspects of bonsai keeping, including aesthetics and cultivation, and the book also includes a detailed plant database. Bonsai trees became popular among rich Americans who wanted to show their wealth and international taste. This was especially true in the finance industry where wealthy traders wanted to show of their newly gained wealth. In early 1963, the Bonsai Society of Greater New York was founded. Within three years, the organization had 555 members, including 339 corresponding members in other parts of the United States and the world. For many non-Japanese people, the art of Saikei was unknown until 1963 when the book “Bonsai-Saikei” by Kawamoto and Kurihara was published. Saikei, which means planted landscape in Japanese, is the art of creating tray landscapes that combine miniature trees with related vegetation (e.g. ground cover) and elements such as rocks, water, soil, etc. The book describes how you can make tray landscapes using much younger plants than those typically utilized for bonsai. To mark the 1964 Summer Olympics in Tokyo in October, the Kokufu Bonsai Association (Nippon Bonsai Association) held a great bonsai exhibition in Hibya Park that month, visited by both locals and foreigners. Also, a commemorative album titled “Gems of Bonsai and Suiseki” was published in Japanese and English. In 1967, the renowned Ōmiya Bonsai Village received its first group of students from the West. As they returned to the United States, they formed the American Bonsai Society. The Ōmiya Bonsai Village had been founded near Tokyo in 1925, after earthquake and fire had destroyed the part of downtown Tokyo where these bonsai growers were living and working. A large display of bonsai and suiseki was included in the Expo ’70, a world’s fair held in Suita, Osaka, Japan from March to September. 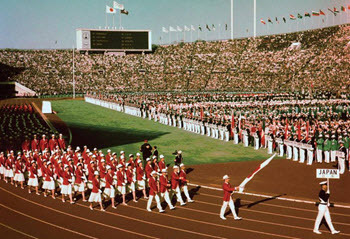 This was the first world’s fair ever to take place in Japan and it attracted a lot of foreign visitors, including visitors from the United States. In 1972, bonsai master Yoshimura delivered a lecture where he spoke about his dream of there being a place in the United States to which bonsai keepers could donate and will their precious plants, knowing that they would be well cared for. Dr. John L. Creech, the newly appointed Director of the United States National Arboretum, heard the lecture, and he suggested to his department heads that the arboretum should create such as place and acquire a bonsai collection. His suggestion was well received and eventually resulted in persons and organizations in Japan gifting 53 bonsai and six suiseki to start the collection. This is how the National Bonsai and Penjing Museum was formed. 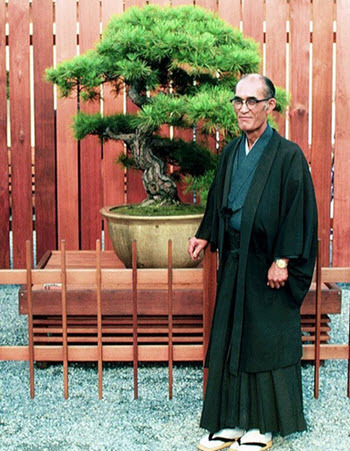 One of Yoshimura’s students in the United States was the Greek-American William N. Valavanis, who went on to become a great bonsai teacher in his own right. With some help from Yoshimura, Valavanis launched the quarterly magazine “International Bonsai” in 1979. The young Valavanis began making bonsais when he was just 11 years old, an as a 15 year old he was lecturing on bonsai at local garden clubs, before starting his own House of Bonsai business. The First World Bonsai Convention was held in Osaka, as a part of the World Bonsai and Suiseki Exhibition. The United States National Bonsai Foundation was formed in 1982 on behalf of the National Bonsai and Penjing Museum of the National Arboretum. In 1984, the book “The Japanese Art of Stone Appreciation, Suiseki and Its Use with Bonsai” was published and it quickly became a go-to reference work for bonsai keepers. The authors are Vincent T. Covello and Yuji Yoshimura. The World Bonsai Friendship Federation (WBFF) was founded in 1989. 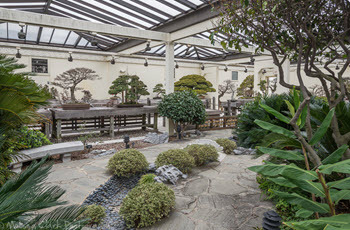 In 1990, the John Y. Naka Pavilion was dedicated for the National Collection of North American Bonsai. Two of the bonsais kept here were made by Yuji Yoshimura. Adjacent to the John. Y Naka Pavilion is the Yoshimura Center with its workshop room and space for lectures to be held. The 1950s was the start of a trend that only grew stronger over time, and today, anyone interested in learning about bonsai can chose between over 1,300 books in over two dozen different languages. There are also numerous magazines and online web sites, as well as bonsai clubs, bonsai online forums, and bonsai courses, including webinars.